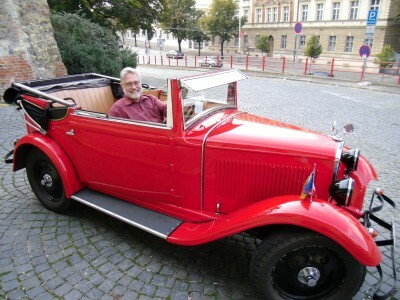 This Skoda was manufactured in 1931 via a Czechoslovakia firm. It features a 4 cylinder,1.2 liter engine, 22 horsepower and 4 speed transmission. The picture was taken in Prague in September 2011 during the vacation of James Michael O’Connor[son of the writer] and his wife Viki. This is the first foreign car picture and article entered on this website. Jim said he saw 3 other Skodas used as rented tour cars. Got to admit it would be a fun way to tour!! !